As many collectors know, Sidney Crosby does not sign with other athletes for trading cards. In fact, the only time he has before was back in his rookie season when he signed a dual autograph card with Wayne Gretzky. 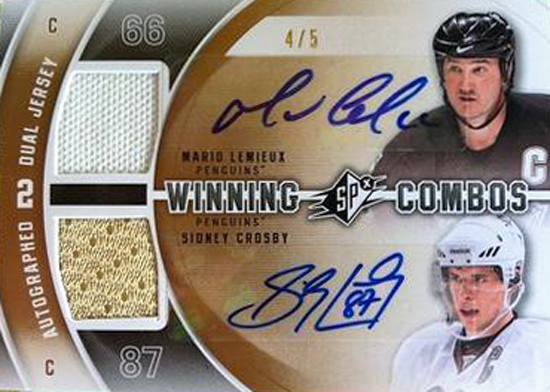 Recently however, we were able to get Sidney to agree to sign a very limited amount of dual autograph jersey cards with his good friend and mentor Mario Lemieux in 2011-12 NHL SPx. Up until this time, the only other person who has appeared on an autograph card with Sidney Crosby has been, well, Sidney Crosby. There were only five total copies of these cards and the first one just hit eBay and is already at $430 with five days remaining on the auction. There are four others out there waiting to be discovered in packs of 2011-12 NHL SPx. If you are lucky enough to pull one, please contact us at UpperDeckMarketing@upperdeck.com. Shouldn’t be too much longer Ron. Once we have a hard date we will publish! Great stickers. I don’t think peeling stickers out of books and placing them on cards really counts as a dual signed card. Show me something Crosby and Lemieux both had in their hand. Well we will be finishing out this year with some hard-signed releases where you may see just that! Stay tuned!!! 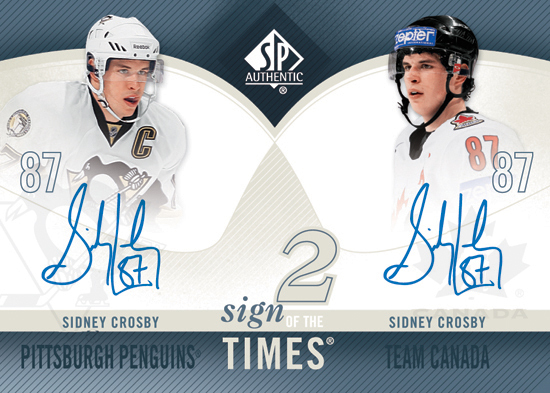 i pulled one of the duel signed crosby cards from sp authentic i cant seem to find i listing for it in any price guide or on any check list?? any one have any idea what it is worth and how short run is it?